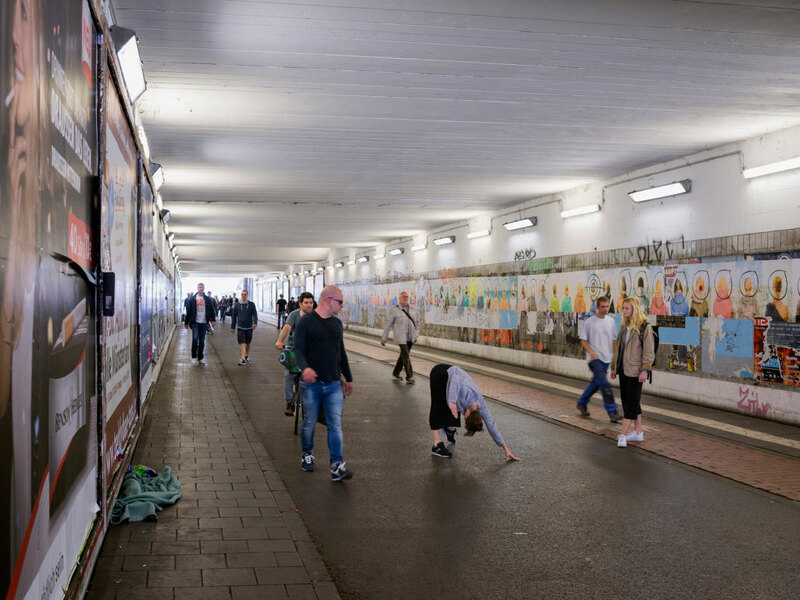 Skulptur Projekte Münster 2017 included multiple projects designed to generate individually unique experiences—perhaps none more so than Still Untitled by Xavier Le Roy and Scarlet Yu. Developed with the concept of inviting any individual to publicly present the work at any time and place, the project was realized through a series of open workshops led by the Still Untitled team. During these workshops, participants developed individual living sculptures they would perform with their own bodies, and learned a specific dialogue frame to be used in the presentation of the work. These two elements—the public presentation of the physical sculpture and the dialogue generated by the frame—formed the work Still Untitled. Each performance occurred according to the impulses of the individual presenter. There were no announced times or locations for the performances and the “audience” was a person selected by the presenter who, due to the design of the dialogue frame, became a participant in the work rather than remaining a passive observer. These variables of time, place, and participants, along with the relationship of those to the wider context of Skulptur Projekte Münster, impacted the individual experience and resulted in many unique presentations of the work. The author participating in Ayşe Erkmen’s On Water, 2017. The element of time plays a critical role in each of these projects, as it does in Still Untitled. The most direct involvement of time involves the commitment required to become a presenter of the work. Participants were asked to register for an introductory workshop, “Embody Your Sculpture,” and a second workshop, “Make It Public,” each of which lasted for two-and-a-half hours. This was my first visit to Münster and I had a limited amount of time in the city to experience all of the projects, so I was somewhat hesitant to commit five hours to one project. But I was traveling alone for a week to visit both Skulptur Projekte Münster and documenta 14, and I felt this would be an opportunity to meet others and engage in conversation about the art installations. I was also interested in challenging myself personally and creatively by participating in a public, performance-based work. For nearly two decades, I have worked at art museums in roles related to education, curating, public art, and administration. Among the most enjoyable hours I have experience professionally are those spent conversing with the public about contemporary art in my current position at 21c Museum Hotel in Louisville, Kentucky. In all these instances, I view my role as existing behind-the-scenes; guiding guests through their experiences with works of art. Individually performing a work of art for complete strangers in a city where I was an outsider was an intimidating prospect. Within hours of arriving in Münster, I attended the first workshop, “Embody Your Sculpture,” which involved a series of exercises with the workshop leaders and participants. Moving through the space, we learned a certain comfort with physical and conversational interactions, which exposed varying levels of vulnerability and connection between individuals. We began by walking randomly through the space and upon encountering another person, we stopped to shake hands and introduce ourselves, a fairly benign interaction. From here, our discomfort and intimacy both increased in the next exercise. We again walked randomly through the space, but in this exercise each time we made eye contact with another person both individuals were to freeze their bodies and maintain eye contact. The shared awkwardness of the situation evolved into a connection between strangers, which began to prepare us for physical and conversational interactions in public. Interspersed between these movement sequences were discussions about the nature and quality of time. The dialogue frame of Still Untitled includes the presenter asking the audience/participant “How is your time today?” As a group, we discussed the nature of time, the specific semiotics of the question, and individual responses to the inquiry. Many of us expressed our view of time as a quantity, a commodity we “spend,” rather than something we view in terms of quality. The phrasing of the question creates a situation in which we view time as a separate entity with its own quality of being. We have a measure of control over this being, but not full control and the ways we respond to that condition impacts our view of our time. Discussions of something as universal and banal as time can also bring about an awareness of differences and understanding between individuals. In one of my interactions with a fellow participant, we discussed the impact of travel on the quality of our time. I traveled between cities by train that day and felt time had been out of my control, whereas, he expressed that the act of traveling refreshes him—he views it as a suspended time. We discussed the impact on the quality of time that lies in the manner one mentally approaches practices such as transportation and, in turn, the impact of cultural norms on our individual experiences and attitudes. Jacob K. Stanley, Sweat Equity, 2012. Reclaimed windows, found lap siding, wood, architectural remnants, used metal roofing, concrete and bricks. New Albany Public Art Project: Bicentennial Series, New Albany, Indiana. The first workshop culminated with each of the participants developing a sculpture performed using our physical body, which was intended to relate to our personal concept of sculpture. In small groups, we were each asked to describe a sculpture that had impacted us personally. Sweat Equity by Jacob K. Stanley was the sculpture which came to my mind. It was installed in New Albany, Indiana as a part of a project I managed, the New Albany Public Art Project. Located on the property of a church, the sculpture served as a catalyst for a meaningful dialogue among the members of the church and neighborhood residents about what art can be; its contributions to a community; and the realities of the tumultuous process of rehabilitating homes, neighborhoods, and communities. Marta Minujín, The Parthenon of Books, 2017. Steel, books, and plastic sheeting. Friedrichsplatz, Kassel, documenta 14. photo: Roman März. Next, we were asked to describe an existing sculpture that could serve in a sense as a portrait of us individually. Having experienced The Parthenon of Books by Marta Minujín in Kassel, Germany earlier that very day, I shared with the group how books embody memories and powerful emotions for me, as they have been a significant part of my life through not only the joy, sorrow, and information they have brought to me, but, more importantly, through their role in my life as a symbol for my mother, who worked as a librarian and taught me and countless other children of their value. At the end of the exhibition period for this work, The Parthenon of Books was dismantled and the books were distributed to the public, giving to the community in a meaningful and educational way and positively sharing an artistic experience among individuals, something I strive to do daily. Building upon this, when asked to translate this sculpture into a physical presentation, I developed a series of movements to imitate taking a book from a shelf, opening it, and holding it out as a way of presenting it to another person—this is my sculpture. In the second workshop, “Make It Public,” we continued the dialogue begun in the first workshop and presented our individual sculptures to each other, using this as an opportunity to gain feedback and refine our sculptures. The goal of this workshop was for each of us to present our sculpture in a public space to strangers. We collectively decided to go to the LWL-Museum fur Kunst und Kultur to perform our first public presentations, as we felt we would find individuals who would be receptive to such an experience at the museum. As we arrived, most of us felt some hesitation and initially observed visitors in the museum as several of the Still Untitled team members spread out and engaged with the public to perform the work. Looking for someone I hoped would be open to an interaction, I noticed a lone figure carefully studying the postcards displayed in the lobby. She looked to be a woman just a bit older than myself and, as she was alone, I hoped she might welcome conversation. Approaching her, I said, “Hello, my name is Karen.” She turned to me and said, “Hello.” Following the dialogue frame, I continued, “Have you heard about Skulptur Projekte Münster?” She replied that she had and kindly asked what I wanted to know about it. Attempting to continue with the dialogue frame, I said I wished to share with her that artists are invited to present sculptures in public space, the Skulptur Projekte happens every 10 years, and this is the 5th project. I then asked, “Can I show you my sculpture?” This seemed to surprise her and she asked, “Where is it? How long will it take?” I replied that it would take only a few minutes and I could show her right where we were. A skeptical look crossed her face as she looked around the space and again said, “Where is it?” I said it is right here and started into the movement sequence to present my sculpture. Realization dawned in her expression and she said, “Oh! It’s a performance.” She watched quietly and when I finished she said, “Thank you.” I asked, “How is your time today?” She replied that it was good and she was enjoying the museum. Then, with a very curious tone, she asked, “Are you an artist?” I shared with her that I am not an artist, but rather an art historian who works at 21c Museum Hotels. I told her about the Still Untitled workshops and we talked about why I participated and what the experience had been like. In keeping with the last line of the dialogue frame, I finished by saying, “This is part of Still Untitled with Karen Gillenwater and…” (I gestured to her and she shared her name) “…by Xavier Le Roy and Scarlet Yu.” We both wished each other well and parted ways. It was a positive and enjoyable exchange and I felt rewarded in accomplishing my first public presentation of Still Untitled. I went on to present my sculpture to two other individuals at the museum, who were also appreciative and very interested in the experience. Still Untitled carried on the fluid approach to the concept of sculpture embodied in Skulptur Projekte Münster through the creation of sculptures made from the living bodies of any members of the public who wished to participate. It also created the possibility for anyone in the city to encounter art at any time or place. The form of the project created an interaction with a physical sculpture, though it was a much more personal than objective as that sculpture was also the body of a stranger. Each presentation carried with it a level of discomfort, which, as I observed in the workshops, could generate a certain type of openness to connection and dialogue. This conversational exchange was also a critical part of realizing the work Still Untitled. As the artwork exists in the collaborative experience of all parties, I feel I made connections with not only the individuals with whom I shared my experience, but also all of the others who have participated in this project. It was as enjoyable to converse with others in the workshops as it was ultimately rewarding to work up the courage to present my sculpture in public with strangers. Sharing these experiences with other visitors, interacting with performers and participants, and seeing Münster during an influx of visitors focused on contemporary art was a valuable personal and professional experience for me. I was impressed by the enthusiasm and interest in dialogue I encountered in my entire experience of Skulptur Projekte Münster from residents and visitors alike, all while finding my way through the city to discover the projects, moving in and around sculptural works, viewing performances and video installations, and even waiting in lines. Karen Gillenwater is a curator and museum educator who has worked in a diverse array of museums and currently holds the position of Museum Manager at 21c Museum Hotel Louisville. A multi-venue museum with over 75,000 square feet of exhibition space across seven locations that are open free of charge 24 hours daily, 21c Museum Hotels is North America’s first museum dedicated solely to collecting and exhibiting the art of the 21st century. Previously, Gillenwater served as Curator at the Carnegie Center for Art & History in New Albany, Indiana, where she also managed the New Albany Public Art Project, and held positions at Georgetown College, Georgetown, Kentucky; the Speed Art Museum, Louisville, Kentucky; and the Denver Art Museum, Denver, Colorado. She holds a Master of Arts in art history with a concentration in museum studies from the University of Denver and a Bachelor of Arts in art history from the University of Evansville. Her travel to Skulptur Projekte Münster 2017 was supported by a grant from the Great Meadows Foundation.